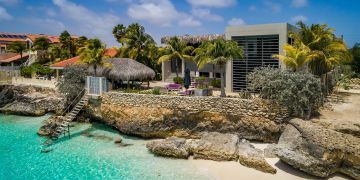 This large villa with the name 'Villa Nirvana Lodge' is located in the Belnem area on the South-West side of the island. With a total of 6 bedrooms and 6 bathrooms this villa is perfect for larger groups. All bedrooms are outfitted with a kitchenette and on the ground floor the common living room, large kitchen en coverd terrace can be found. 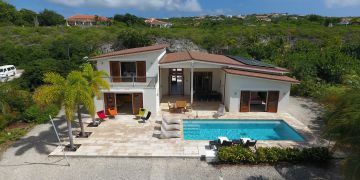 The villa has beautiful sea views from the bedrooms upstairs and from the ground floor living room area, the turquoise blue colors of the Caribbean Sea ensures your caribbean experience. The swimming pool amplifies this effect with an infinity edge that seems to flow into the Caribbean Sea. The location of this villa is perfect, close to the windsurfing beaches of Sorobon, the kitesurfing beaches of Atlantis and several dive sites nearby. Perfect for the watersport enthousiast and avid divers. Right at your doorstep and just a few fin kicks away, divers and snorklers can admire a beautiful house reef. Kralendijk is only a 10 minute drive away. Landscaped garden with watering/drip system, palm trees, gravel stones and paved walkway. At the streetside a walk in gate gives acces to the premises. Entrance via street, dubble opening wooden doors, hallway leading to 2 car garage, storag area, 3 bedrooms with en-suite bathrooms and kitchenette, living room with sliding doors to covered terrace, kitchen with pantry room. 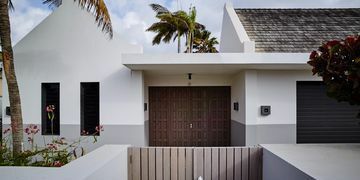 From hallway stairways to second floor, 3 bedrooms with en-suite bathrooms and kitchenette, of which 2 bedrooms are located on the sea side with views over Caribbean Sea. Those two rooms have access to a balcony in front.